Rhythm games have enjoyed widespread popularity over the past few decades. Going back to the 90’s, we had classics like PaRappa the Rapper and Dance Dance Revolution. Skip ahead to the mid-2000’s and the world was being taken by storm by the likes of Guitar Hero and Rock Band. Whether you’re banging on a wireless drum set acting like you’re Neil Peart, furiously moving your feet to hit the pads in the right order, or just pressing buttons in time with the music, rhythm games have carved out a niche for themselves as one of the most popular and mainstream game genres. Better work on those reflexes, you are going to need them! So, with virtual reality slowly making its way to the mainstream, how will rhythm games adapt? Cue Audioshield, one of the first rhythm games to come out for VR. 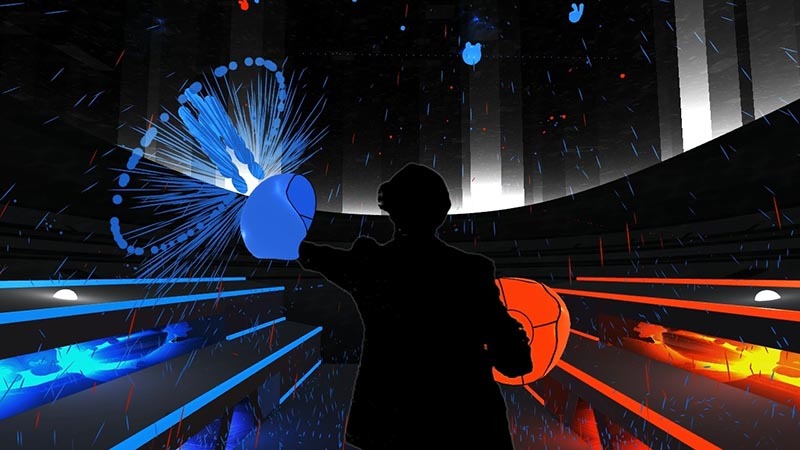 Audioshield presented an entirely new way to play rhythm games: instead of merely pressing buttons to make something happen on-screen, Audioshield lets you virtually interact with the music by blocking (or hitting) the beats as they fly at you. Does this innovative new way of playing launch Audioshield into the pantheon of the truly great rhythm games? The short answer? Almost. As for the long answer, let’s examine exactly how things work in this game. 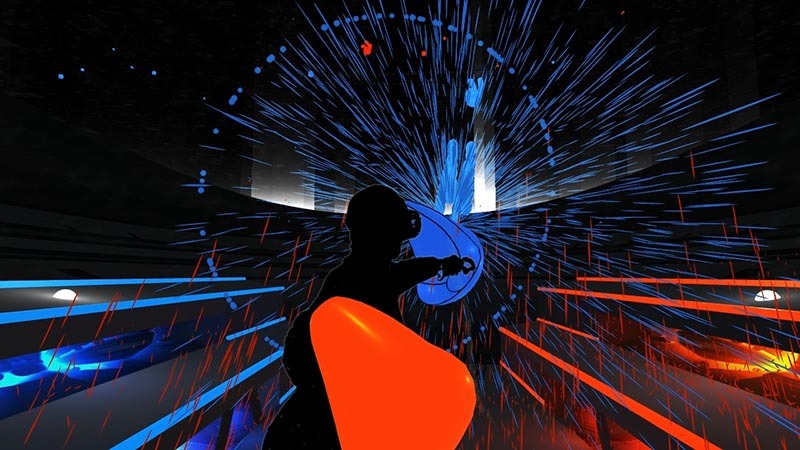 In Audioshield, your virtual hands are transformed into…well, as the title implies, shields. You can choose from three different styles, but the one constant across all three is that your left shield will always be blue and your right shield will always be orange (or red, depending on who you ask). The shields are used to “block” the music. If that sounds confusing to you, let me explain – when you pick a song, the game has a built-in algorithim that picks up on particular sounds – drums, bass, vocals, guitar, etc. – and transforms those into orbs that you have to block in time with the music. The orbs will either be blue or orange, so you have to block them with the correct color shield too. Sometimes you’ll get a purple orb, but a purple shield is easily obtainable either by holding your two shields together or by pressing and holding the trigger button on both controllers. Depending on which difficulty you pick, the game will create more or less orbs for you, sometimes in hard to reach locations or in different shapes on the higher difficulties. Your overall goal is simple – block (or hit) as many orbs as possible and try to get the highest score. Since the game is in virtual reality, however, accuracy is not the only way your score is determined. The game will also track how hard you hit the orbs, which is why I alluded to hitting the orbs instead of blocking them earlier. Putting more force into your punches will result in a higher overall score, so moving around and getting into the music is highly recommended. I love these explosions every single time! Speaking of the music, I haven’t even gotten to the best part of this game. Rhythm games will sometimes have predetermined track lists, so you can only play a set handful of songs in each game. Audioshield does things differently – since the algorithim they use is completely randomized, it means that you can quite literally use any song you can find on YouTube, or any songs you already have in your own computer! Having an unlimited library gives Audioshield a huge boost versus other rhythm games, although it does come with one catch – not every song is going to work. I don’t mean that some songs will be unplayable, but that sometimes this algorithim doesn’t pick up on things you would expect it to, resulting in some songs I thought would be hard instead being almost comically easy. That being said, there are still plenty of good songs to choose from, and you can always look up recommendations online. Audioshield was one of the very first games I bought with my Vive, and to this day it is still one of my most played (156 hours and counting). The core gameplay is consistently satisfying, and with an unlimited library it’s so easy to keep coming back to over and over again. Some songs will work better than others, but it’s all about finding which ones work best for you. If you’re looking for a VR game that you can easily sink hundreds of hours into, look no further than Audioshield. What would I pay? As long as you’re willing to experiment and try out different songs to see what works, the $19.99 price tag is more than worth it. I’ve seen this game go on sale a few times though, so you could get a better deal if you’re willing to wait.